We have stock of the 6N1P-EB(Military grade) old stock from Russian surplus. Sounds way better than the currently produced Svetlana, for sure! Can work for 6922, but draws more heater current, so check with the mfg. 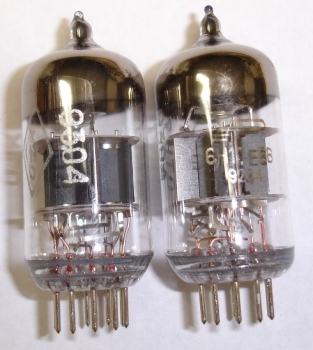 of your amp before installing.LOW NOISE AND MICROPHONICS,BALANCED TRIODES ARE INCLUDED. SELECTED AND CRYOGENICALLY TREATED FOR THE ULTIMATE IN SONIC PERFORMANCE!!! SOLD AS MATCHED PAIRS.